In the mid-nineties I climbed Roman Mountain for the first time. No inkling then of the dozens of future ascents related to the Emperor’s Challenge, nor of the mountain’s destiny as a coal mine. My hiking partner was my colleague Dr Nigel Myers. We stopped on the way up for a sandwich, and somehow the angle of the sunlight was just perfect to illustrate something strange on the rock beside which we were sitting. Quite unmistakably, there were fossil footprints etched into the rock. Knowing precious little then about geology or palaeontology, it took me a while to establish that these were fossil bird tracks from the Gates Formation, and were about 100 million years old. Yet I somehow got it that this was something wonderful and special for the Tumbler Ridge area, so much so that I decided to use a picture of these tracks as the front cover of my first book on the area, “Beyond Rock and Coal”, published in 2000. Fast forward almost twenty years to 2014: fossil trackways have made our town and area globally famous, have helped Tumbler Ridge to survive, and continue to catalyse the diversification of the Tumbler Ridge economy and act as a magnet for visitors. But until last week, that trackway on Roman Mountain hadn’t budged. Some efforts had been made to recover it. As the NEMI mine developed and roads were built closer to it, dragging it onto the back of a truck was considered, but the 600 pound weight estimate meant this was unfeasible. Rock-sawing the slab of rock into a manageable chunk was considered, but Richard McCrea, Curator at Tumbler Ridge’s Peace Region Palaeontology Research Centre, wisely vetoed this suggestion. “There could be other tracks on this surface, that we will only see under optimal lighting,” he insisted. Early snowfalls thwarted a 2013 helicopter attempt. Finally things came together at the end of August 2014, with the much appreciated logistical support of Peace River Coal (Brandon Lewis) and expert flying by Marc Bresse of Ridge Rotors. 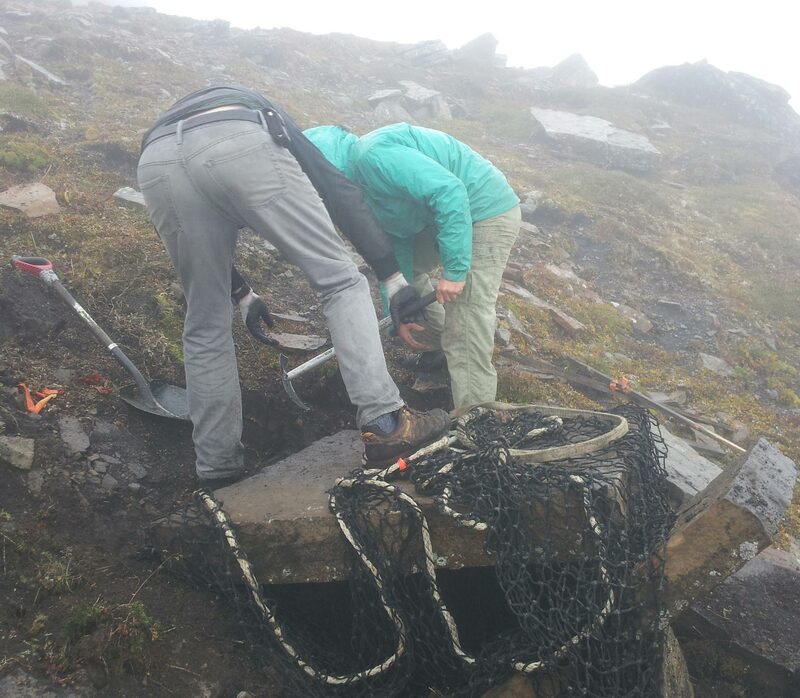 On a misty day the team landed lower down, carried the net 600 metres uphill, and placed the rock within it. Five days later, with the first break in the weather, Marc landed beside it, hooked up the net, and just a few minutes later it was on the back of a truck and heading for the museum in Tumbler Ridge. Over the years, it has received some attention, being documented in the landmark study by McCrea et al in the scientific literature. Now that is about to escalate, as McCrea\s wisdom in preserving and recovering the entire piece has paid off handsomely. In the lab the entire footprint surface comes to life, and many other fainter tracks and trackways become visible to the trained eyes of McCrea and fellow-palaeontologist Lisa Buckley. As we now know, birds are descended from dinosaurs, but the documentation of fossil bird tracks is still at an early stage globally, and a specimen like this is quite significant. As the layer of surface lichen gets removed, using a technique pioneered here in Tumbler Ridge by these scientists, even more detail can be expected, and another ground-breaking scientific research article can be anticipated. In turn, this cements the reputation of Tumbler Ridge and its proposed Geopark as an area of active research, improves funding opportunities, makes for positive national and international attention, etc. Once on display in the Dinosaur Discovery Gallery, this specimen will complement two other remarkable bird track exhibits. One is from the Boulder Gardens, and visitors can purchase a replica of it as a souvenir item. The second was discovered in 2013, and represents some of the oldest known bird tracks in the world. Add to this a new site discovered just two weeks ago, and it becomes clear that Tumbler Ridge is becoming an important planetary node not just for dinosaur tracks, but for bird tracks too. In Tumbler Ridge we love the downtown Roman Walkway as a focal gathering point for events and celebrations. For the museum and research centre, however, the successful recovery of this other “Roman Walkway” provides plenty more reasons to celebrate and reflect on the incredibly productive summer of 2014.